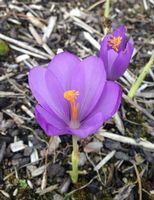 A very strong growing crocus flowering in November. 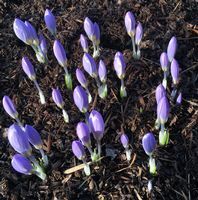 Great for colour in the winter garden. 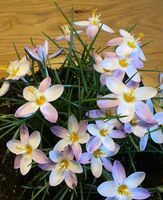 Autumn flowering stoloniferus crocus that will naturalise well. 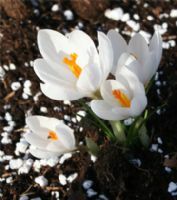 A golden flowered Crocus which is happy outside in a well drained raised bed. 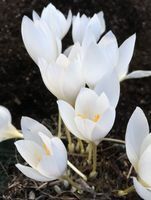 Easily grown Autumn flowering Crocus with bright white flowers. 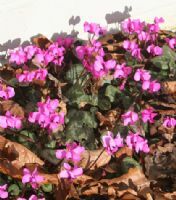 An autumn flowering cyclamen which does well outdoors in a woodland type situation. Over time it will seed about and carpet dry shady areas. 6cm tall. 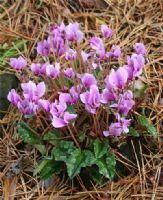 Attractive herbaceous woodlander, pale pink flowers, very early flowering. QUANTITY DISCOUNT. This form has pale pink rather than the usual cream flowers along with the usual attractive grey foliage. 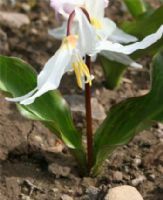 An Erythronium with a reputation for shy flowering, however with this clone each bulb produces a flower. 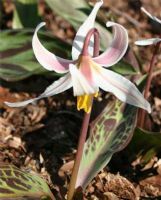 A super strong growing Erythronium with attractive leaves and well marked flowers from the west coast of America. A rarely seen Erythronium with large bright yellow flowers, and shiny green leaves. These are a mixture of Erythronium helenae and howelii. 3 bulbs, a good bargain if you don’t mind not having a proper name. One of our own hybrids. A strong growing and fast multiplying cross between revolutum and White Beauty.Lovely pale pink with brown ring. Latter flowering Frit chequered brown and green. Will reach 2ft if happy.